If you remember, I put up with a lot of annoying fussiness (and that’s the worst kind of fussiness, don’t you agree?) before casting on the Harvey Kimono. Wow, what a difference! Simple and intuitive construction, with clear and concise directions: that’s all it takes to make me happy :). To tell you the truth, I modify every pattern that I knit, even those about which I say, “I knit this without changing a thing!” It’s just that there are some patterns, like the Harvey Kimono, where the changes are so miniscule, they aren’t even worth mentioning (here, reinforced buttonholes instead of basic ones, narrower side edging because I was running out of yarn). So, “I knit this without changing a thing!” Heh. Yarn: Kraemer Yarns Tatamy Tweed DK (45% cotton, 55% acrylic, 250 yards per 100 gram skein) in Walnut, 1 skein. Yes, just 1 skein! The cost effectiveness of this is tantalizing! Needles, gauge, and finished size: As recommended in the pattern, US 5 (edgings) and US 6 (main). My gauge ever-so-slightly differed from the one in the pattern: 20.5 sts and 32 rows = 4″. So, the finished sweater is a little bit wider than prescribed: about 17.5″ around the chest, 7.5″ from hem to shoulder, and 6.75″ from cuff to armpit. One of the great things about this pattern is that it tells us to knit 4 buttonholes, 2 on each front, so we can overlap the two flaps in whichever way we see fit. I chose “left over right,” and adorable turtle buttons. However, I was puzzled by the request to attach 4 buttons – I couldn’t figure out the best way to handle those which would be on the inside of the sweater. No matter how carefully I stitched, the spots where the two inside buttons were attached dimpled. So, instead I sewed on one big button and a loop of trim. It just made more sense to me. 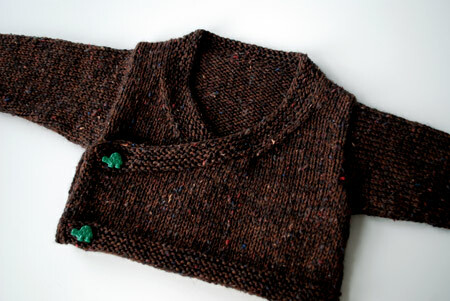 Overall, a quick, easy, satisfying and destined to satisfy knit! And another gift checked off the (seemingly always-growing) list. Oh man, very cute. How I am wrestling with an almost-done 6 month size sweater in which I altered the pattern. Now I can’t seem to find a satisfactory solution to the neck/raglan button band. Why can’t I just follow the pattern? Good for you for doing that. Maybe your recipient will be a chubby baby and the little extra width will be just right! Now that’s a color I could love… and I’m not much of a brown person. Might have to get me some. Very cute sweater, thanks for sharing. So cute!! I love the color and textured look. Oh man, this yarn is gorgeous! It looks so rich and cozy! Looks cute! I’m thinking of making another one … mayeb in sock yarn this time. That is adorable! 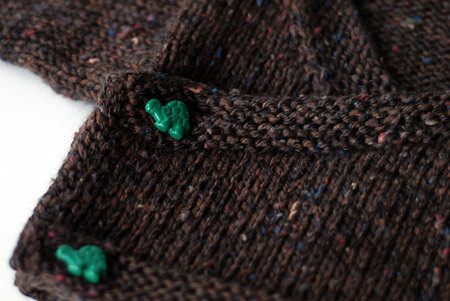 The little turtle buttons are such a great detail. I love the turtle buttons! When I run into the over-lap button deal/problem with the puckering I double the buttons on that side, i.e. 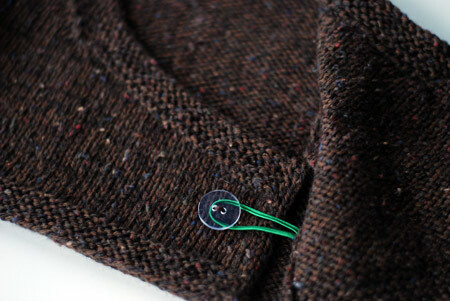 sew one decorative button on the outside to hide the pucker of the inside button. Really cute. I love the curves and straight angles on the front, and your yarn choice is sweet.. very grown-uppy, which can be extra cute on a babe, and can tone down their normally absurd clothing. 🙂 I am very interested in how it fits on an actual baby! Very cute. Brilliant button solution. looks great. love the buttons and the color. The buttons make the sweater. So cute! I love the sophisticated color with the fun turtle buttons. thank god this one wasn’t as fussy, it came out beautifully. Cute buttons! The sweater is lovely too. Wow, that’s cute. 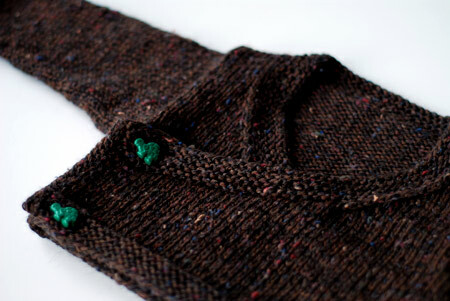 I have a go-to baby kimono sweater that I’ve knit many times, but this might just displace it. Especially because mine has a gauge of about 30st=4″, and this is, well, much more reasonably gauged. I LOVE the turtle touch! It adds such a nice touch to the sweater! Great choice. Lovely. I will have to remember this tweedy yarn the next time I want to make a quick, satisfying project without breaking the bank. And I love tweed! I made this as my first attempt at a sweater. It was so fun! Totally adorable. I am such a sucker for tweedy baby things. I really love your yarn choice for this pattern and oh! those buttons! This is all around a perfect little project! Your sweater is beautiful. I like the contrasting buttons very much. How cute, I love the buttons too! I have a Knit Kimono book out from the public library (sorry don’t remember the author or the exact title). She said Kimono’s are always left over right except when you are being buried. I don’t expect Louisa would follow that convension, but it does just simplify things. That is a lovely little kimono. Very cute and I’m going to remember that book for baby knits b/c there are some I just don’t want to spend a lot of time on. Does that say something about me?